Ananka's Diary: A Society of Rogue Knitters? A few years back, if you'd happened upon a streetlamp wearing legwarmers--or a statue sporting mittens--you might have questioned your sanity. But these days, anyone with a sharp eye can spot well-dressed fire hydrants, door knobs, and trees in cities around the world. The knit "tags" are the work of a secret society of knitters known as Knitta. It all began in 2005 when a Houston knitter decided to create a "doorknob cozy" for a local boutique. The cozy was a hit, and two other frustrated knitters decided to join her crew. 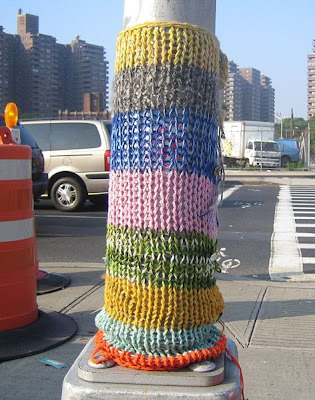 Since then, Knitta has taken its quest to "beautify the public space" around the globe. According to Wikipedia, they've tagged Los Angeles hotels, Notre Dame cathedral in Paris, and the Great Wall of China. this is so cool! I love knitting :D I'd love to do something like this! except yarn is expensive and not extremely waterproof. That is so cool! Can I join? today be talk like a pirate day ye landlubbers arrrrrg! Whoa, how'd they put the stuff on without people seeing them!? OoO And how do they knit that much stuff!?! ?